For freelance creatives, finding free resources can be the difference that makes it possible to pay the bills and keep the lights on. Whether you are a graphic designer, letterer, artist, writer, or other creative, finding places to get things for free saves you both time and money. It’s also a great way to give clients more bang for the buck. Thankfully, there are great websites that offer free resources that will help creative freelancers get their work done on time and on budget. This is a list of the best sites for free design resources on the internet. 365PSD has nearly 50,000 freebies ranging from UI kits, icons, mockups, buttons, patterns, Facebook covers, and more elements to spur your creativity. If you are searching for great free Photoshop textures, patterns, and brushes, Brusheezy has you covered. They also have plenty of other freebies, like print mockups and fonts. Download free psd files, patterns, textures, templates, mockups, icons, ui kits, ui elements, buttons, banners and other psd freebies at Bluegraphic. DB Freebies has a collection of the best freebies design resources from Dribbble and Behance. You can find fonts, mockups, PSD for UI, icons, backgrounds and templates, all free and curated for the best look. DB Freebies pulls resources from Dribbble, which is an excellent archive of design resources. Designer Mill has been offering great free resources since 2015, and designers share new things daily. Looking for patterns, textures, UI kits, icons, website templates and more? Fribbble allows designers to upload their free resources and has hundreds of great choices to pick from. Freebiesbug is the site with “Hand-picked resources for web designer and developers, constantly updated.” Photoshop, Illustrator, Sketch files and much more is available. GraphicBurger has tons of great design freebies. In addition to UI kits, text effects, website backgrounds and more, you can find things like sweatshirt and t-shirt mockups, panel van mockups, motorcycle mockups and everything under the sun. if it’s hard to find it, GraphicBurger probably has it. Icon Deposit is focused on providing you with the best variety of icons, all submitted by designers who are passionate about great icons. Premium Pixels was started by a designer who was frustrated by the lack of free online resources. It has a huge collection of templates, brushes, icons, PSD files and more, all free for personal and commercial use. Do you use Sketch 3? Then Sketch Repo is an invaluable resource of freebies. PiexelsMarket shares inspiration, freebies and tools, including new freebies each week. The site has many enhancements for Twitter, Facebook and LinkedIn design. When you can’t seem to find the right texture and pattern for a project, it’s worth checking out Subtle Patterns. This website has a huge archive of free patterns and textures. 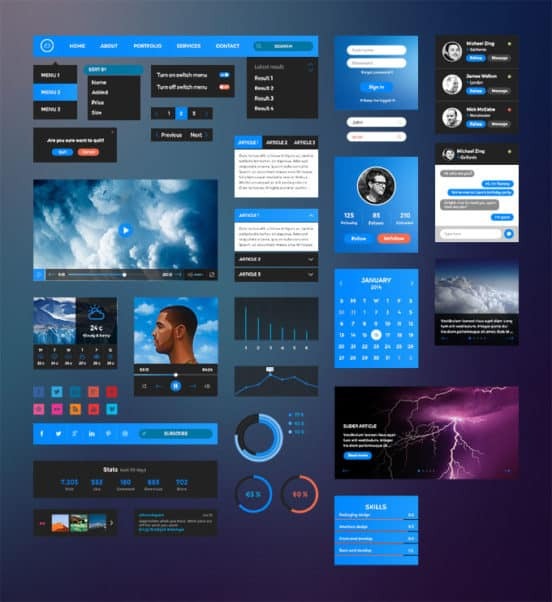 If you are obsessed with UI, then UI Space is the place to go for all kinds of graphic design freebies.